Receive beautiful, insightful daily messages from your own heart with these exquisite oracle cards made with original vibrant artwork, inspired by my own life journey. I made these Heart Whisper Oracle Cards to help you each day grow in love for yourself and spread that love. They do this by guiding to listen to the whispers of your heart where your true wisdom lies. 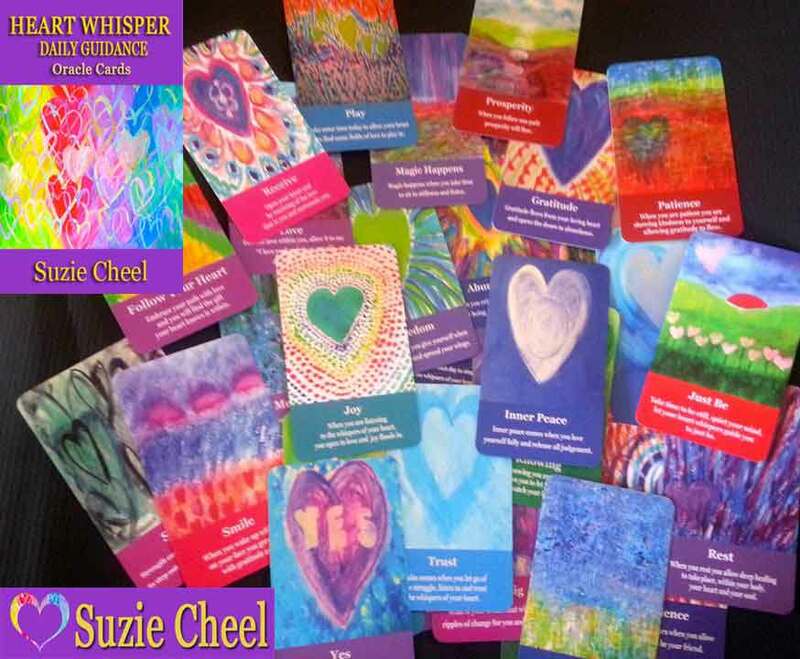 The Heart Whisper Daily Guidance Oracle cards have been born from the whispers of my heart, each card is one of my own paintings from the series that I started back in 2011 as part of my healing process in recovering from a life-threatening illness. ♥ a purple gauze drawstring bag. Learn to love yourself more with the Heart Whisper Oracle Cards. They are magic and when you have your own. plus when Suzie pulls one for you also, it is powerful magic. These cards and Suzie’s coaching has changed my life. What a lovely progression: Joy, Imagine, Confidence… I’m thinking that when I listen to my heart and open to joy while picturing life as I truly desire it the confidence to create and allow it in emerges naturally! Thank you Suzie for always bringing me home to myself and my own heart.